Two Tamil National Alliance campaign offices were set on fire and three TNA supporters' houses were damaged by a group of heavily armed cadres of the Eelam People's Democratic Party, a major coalition partner of Sri Lanka's ruling People's Alliance regime, in Komari, about 96 kilometres south of Batticaloa, Sunday night, Police sources in Ampara said. Three TNA supporters were severely assaulted by the EPDP gang. The Special Task Force (STF), an elite commando unit of the Sri Lankan security forces, controls Komari, a remote village on the island's southeastern coast. No one is permitted to enter the village after dark without the STF's special permission. The once prosperous village in the Ampara district has struggled to survive for more than a decade under draconian STF rule. Cultivation in the large tracts of fertile rice fields in the village's hinterland and fishing in the lagoon are banned. The large coconut plantations are deserted and face general ruin due to STF dictates. Every aspect of life in the village is directly and indirectly controlled by the STF. Arbitrary arrests, detention, torture and extra judicial killings in the village and its surroundings have largely gone unreported due to severe restrictions imposed by the STF on outsiders visiting or staying in Komari. Meanwhile, angry supporters of the TNA in Thirukkovil, the large Tamil village, 18 kilometres north of Komari, burnt an effigy of the EPDP's chief candidate for the Ampara district, Mr. Gunasekaram Shankar. Tires were set on fire on the main road by villagers to stop the EPDP from entering the area. "The Police have done little to stop the EPDP from attacking the people. The STF has stood by when the armed gang went on the rampage in Komari last night. 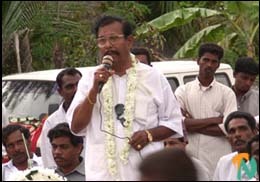 We are concerned that in its sheer desperation the EPDP will attempt to intimidate voters and stuff ballot boxes in remote and helpless villages in the district, particularly because it is very difficult for news to seep out of such STF controlled places", said Mr. Ariyanayagam Chandranheru, the chief candidate of the TNA in the Ampara (Digamadulla) electoral district.